What happens when you can no longer take care of your loved one? Today, thousands of people who are on Medicare, are living longer in nursing homes, with no real quality of life. Their entire life savings dwindle away to pay for long-term care, not Medicare. Let’s clear up a myth, Medicare does not pay for long-term care. 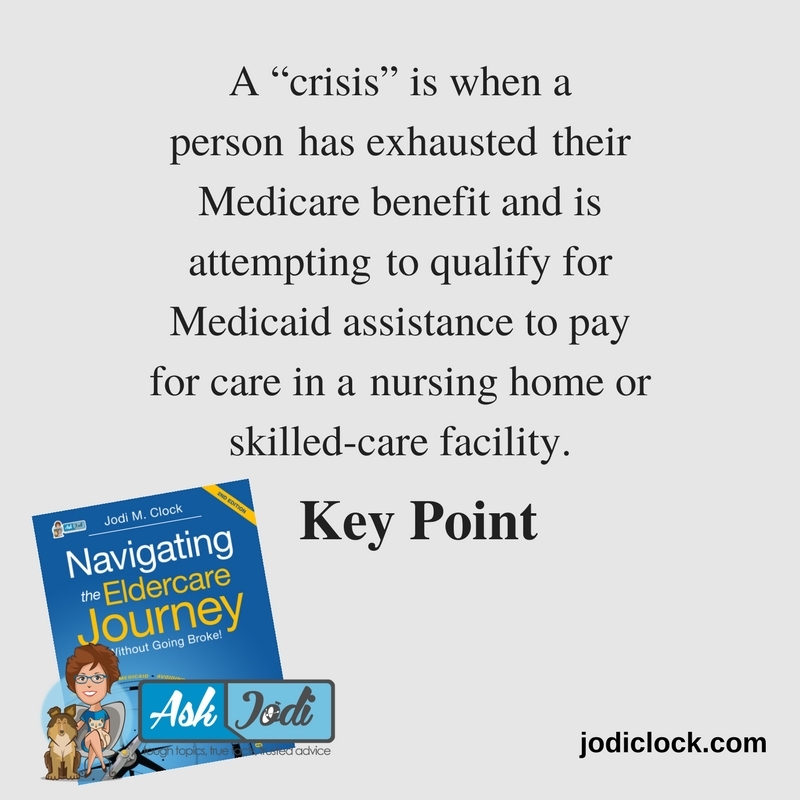 Which begs the question, do you know what you financially know what you faced with placing someone in a nursing home or care facility? Would your adult children know what to do if they are placed in a situation to handle your care? Today’s baby boomers are faced with these type of very emotionally charged decisions, if not for their parents, for their grandparents. Many people are unaware that their loved ones are at risk of losing everything they have worked their entire lives for. This is no exaggeration; this is a reality. 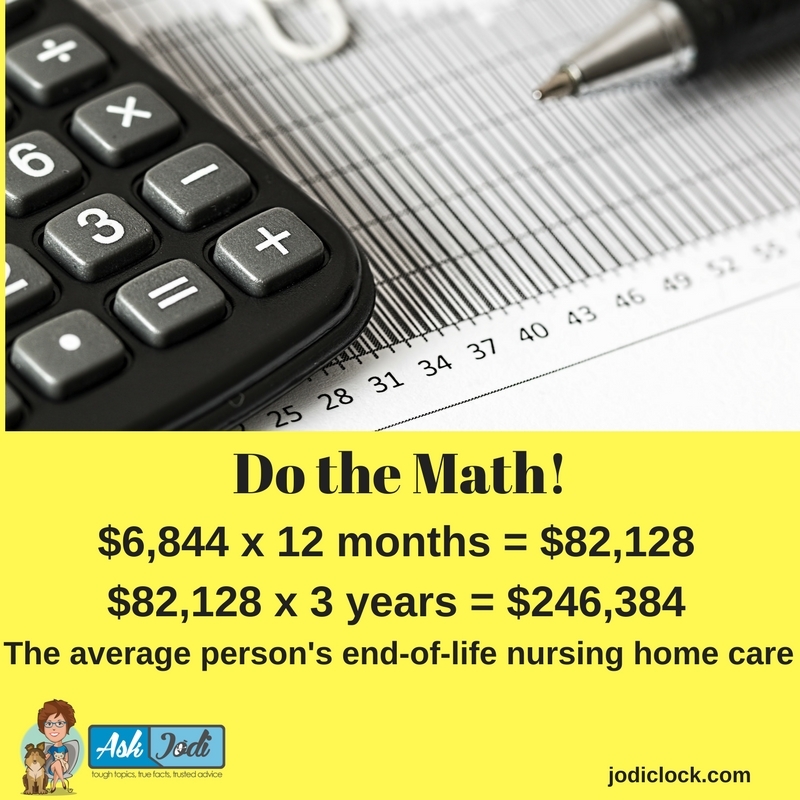 Here is a sobering fact: People who enter long-term care facilities will most likely deplete their life savings in less than one year, often in fewer than 120 days. Here are just some of the by-products that occur when your loved one runs out of money to pay for care? They may have to sell personal effects. Their nest egg will be depleted. There will be no inheritance for the family. Eventually, your loved one will become financially dependent on government assistance, Medicaid. Medicaid is a United States government program providing hospitalization and medical insurance for people of all ages within certain income limits. For more information, visit Centers for Medicare and Medicaid Services. Chances are high that your parents or loved ones will receive Medicaid assistance in the end. Your parent’s assets could end up unnecessarily depleted, while you become mentally drained. Self-proclaimed experts, in good faith, will provide you with pieces and parts of information. You quite possibly will discover the recommendations given either obsolete or, worse yet, exasperate your individual situation. The good news is, this doesn’t have to happen if you are financially proactive. The key to guarding your loved one’s nest egg is knowing the financial allowance guidelines for Medicaid. These rules differ, depending on the marital status of the person in need of care. Bottom line, it’s always easier—and certainly less expensive—to position assets proactively rather than during a crisis. There are advantages and disadvantages to each choice. The payment option you select will be determined either by your family’s value set or purely based on finances. “Medicare is a national health insurance program created and administered by the federal government in the U.S. to address the medical needs of older American citizens. Medicare is available to U.S. citizens 65 and older and some people with disabilities under age 65,” according to the Encyclopedia of Surgery. Using Medicare for long-term care isn’t an option. 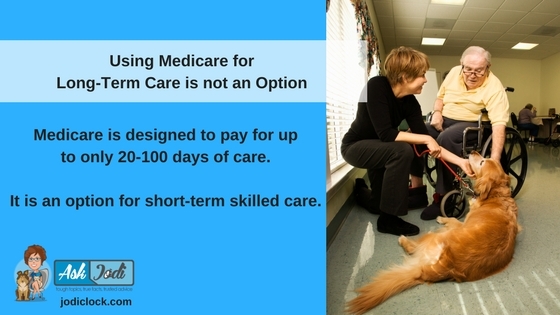 Medicare is designed to pay for up to only 20-100 days of care. It is an option for short-term skilled care. Determining whether or not someone can use long-term care insurance is straightforward. 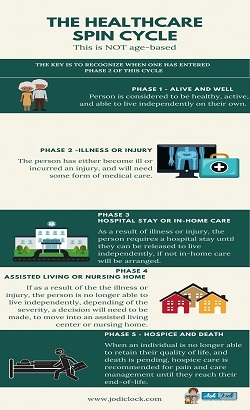 When the person you are caring for reaches stage 4 of the healthcare spin cycle, rather than ask, “Can they purchase long-term care insurance?” instead ask, “Did they purchase this form of coverage?” If the answer is “yes,” investigate to determine the care options covered under the policy. If this form of protection was not purchased, then you must explore other options. It’s most likely they will not qualify for this type of coverage, and if they do, the premiums would be outrageous. In this case, you are better off to seek out alternative methods of payment. • All private Medicare supplement insurance and/or long-term care insurance policy deductibles must be met. Once the deductibles have been satisfied, that policy will begin to pay for a specific number of days in care, depending on the type of private-pay insurance policy. Many policies clearly state a maximum number of days for which payment will be made. • After the first 20 days of care covered by Medicare have passed, expect to be presented with an invoice beginning on the 21st day unless your loved one has a Medicare supplemental policy or a long-term care policy. The invoice will account for all care arrangements, including food and medications. 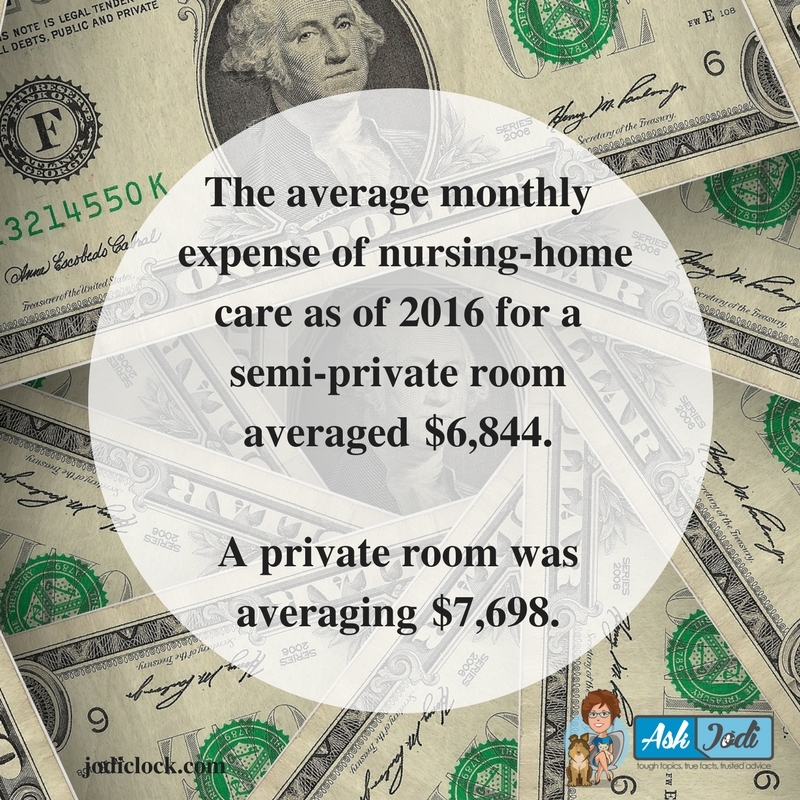 • The average monthly expense of nursing-home care as of 2016 for a semi-private room is around $6,844. A private room is averaging $7,698. The average stay is three years. Will you or your loved one have this amount of money to pay for care? • Is there a spouse or dependent/disabled child who will need to maintain his or her standard of living? How many months of care can be covered before the money runs out? • What will the source of these funds be? Options include: -Checking accounts Savings accounts Annuities Stocks/Bonds/Mutual funds Retirement funds/Pensions Cash surrender value of life insurance policy What happens if the spouse or dependent/disabled child becomes ill? Will private pay still be feasible? • In the end, would you or your loved one end up having to qualify for Medicaid and end up broke? Medicaid is a viable payment option for everyone over age 65 and those who are blind or disabled in need of care when entering or residing in a nursing home. If a person satisfies any or all of the parameters just listed and is single, the qualification process for Medicaid is very straightforward. They can move forward to the next step required by their state. If this person is married, there are different measures to take depending on their situation, which will be addressed later. • A married person in need of care with a living spouse who does not need care? • A married couple in need of care? • A single person in need of care? Many very important facts and issues to take into consideration, have been brought to light. Please remember that I am not an attorney and that I advocate when being faced with these decisions, you seek out an “eldercare” and not an “estate planning” attorney. There is a difference. Both are necessary at different phases in a person’s life. Look at it in the same vain when choosing medical care. Your front line is your internist or general practitioner when surgery is needed you seek out both a second opinion and specialist in that field. 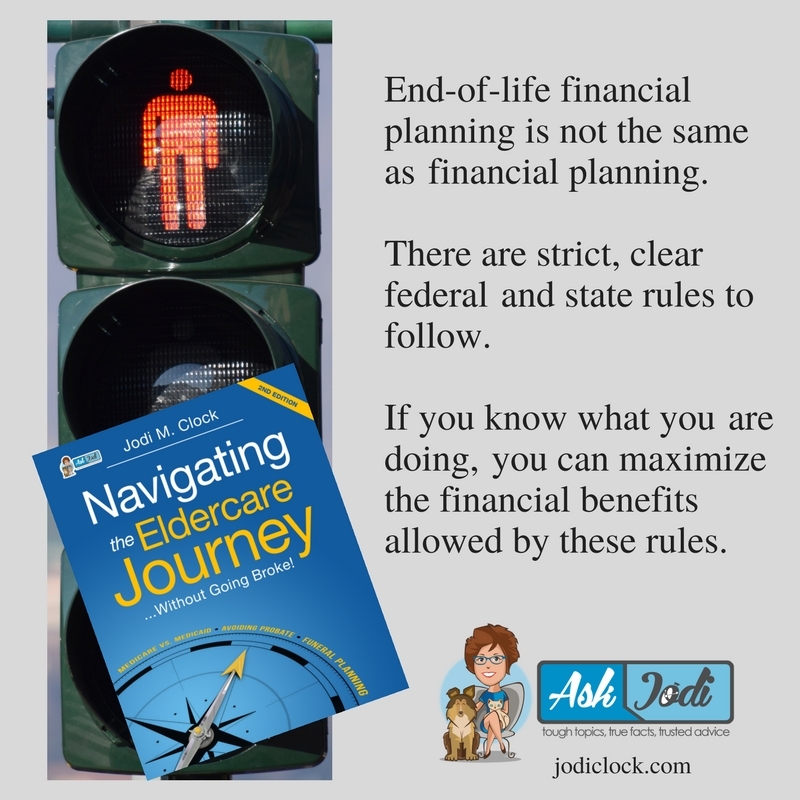 For more helpful information, that will save you both time and money when faced with these types of decisions, consider buying my book, “Navigating the Eldercare Journey…without going broke!”. The second edition is now released. For those who purchase the book, there is a free downloadable workbook to keep you on track and take notes. It makes sense that getting the right long term care would be important. I can see why you would want to get the right method of financing it! That’s something you might need to look for specifically.